It’s the end of March, and normally at this time of year, the cane burning fires start. But not this year. Someone who doesn’t live on Maui asked me, have they stopped burning cane? Yes, it’s the end of cane burning season, now and forever. Some people are nostalgic for the end of an era, when sugar cane plantations stretched across Maui. To harvest the cane, workers lit huge fires covering hundreds of acres, almost every morning, often between 3 am and 6 am, except Sundays and on holidays or days with bad weather conditions. Burning the tall grass made it easier to harvest the cane stalks by hand. Towards the end of cane burning season in December, sometimes the workers had to light two instead of three fires to make up for lost time. Mural in Paia of bygone days: the sugar cane train and sugar plantation. Even though HC&S was formed by capitalist white Americans in the 1800s, it employed many different ethnicities, so speaking against cane burning was seen as being against “local culture” or against the people who were born here. People who moved to Maui from elsewhere represented changes to Maui, so if they didn’t like cane burning, they were seen as outsiders who really shouldn’t have an opinion. This graffiti from Paia in 2012 shows the cultural clashes with sugarcane burning. This graffiti shows a protestor with a sign, "Stop the Burn." A few days later, someone else stenciled "Culturally Uninformed Penguin" as a response. Some people who were born on Maui or long time residents felt they couldn’t speak against cane burning because they would lose their jobs. In addition, there were issues of water usage and inequality since water was being diverted from local streams and taro farms to irrigate the cane fields. Some people believed that HC&S was continuing to grow sugar at a loss only to justify keeping the water permits, so that they could keep water “rights” for developing houses and commercial businesses. Sometime in December, the last sugarcane fire will be lit, burning acres of green fields, scorching the earth, maybe melting bits of irrigation pipe and fittings, billowing smoke in the dark early morning hours. The rats, cattle egrets and mongooses will flee from the flames and rising heat. The wind will take the dust and debris, the charred cinders of burnt grass, the exposed red dirt sprayed with pesticides and poisons, the sweat of generations of workers chafing under the hot Maui sun, their gnarled memories and weather beaten hopes, and blow them across the island like the visible exhaust of a failing engine. The black ashes, ironically called “Maui snow,” will settle on the ground for the last time. The end of the last sugarcane plantation in all of Hawaii. The last sugarcane harvest. The last sugarcane burning. Goodbye to the fires. The earth will breathe a sigh of relief. And so will I. No more sticky, gluey, stabby, itchy, watery eyes in the morning. No more cane ash on the car. No more lingering, persistent cough that would unexpectedly rattle my chest. No more dry, scratchy throat. No more painful nose swelling and redness. No more looking like Rudolph the Red-nosed Reindeer. No more running to the bathroom 10 x in an hour, my body aching to expel contaminated fluid out of my body a teaspoon at a time. No more dripping wet nose and sneezing attacks. No more rasping, creaky voice, like a clawing hand in my throat. While I may have a few of these symptoms when I’m sick or dealing with allergies or vog, the combination and severity of these symptoms only happen during cane burn season and only on Maui. And I don’t live near a sugarcane field. The closest field is probably 7 miles away. But I’ve felt like a canary in a coal mine. If there is sugarcane burning anywhere nearby and the wind is right, I feel it. And shake my fist at HC&S. For nine months of every year, from about mid March to early December, hundreds of acres of fields were burned since the 19th century. Hawaii Commercial & Sugar Co. currently owns 36,000 acres of agricultural fields planted in sugarcane. About half of those fields are burned each year. People who never had asthma in their lives, developed asthma or respiratory illnesses living on Maui. Or worsened allergies. Or other mysterious ailments. I grew up with sugarcane burning on Oahu. It didn’t happen year round. I still hated it. I moved to Maui over 10 years ago not knowing that Maui was still burning sugar cane. I still hated it. The first few years the symptoms weren’t noticeable, but they increased over time. There are many people who are sad about the end of the sugarcane era. I am not. It’s hard for me to be nostalgic about something that has made me feel so sick, and has affected others in my life. Fallow sugar cane fields along Hana Highway. Now as people look at the red fields, they look at scraggly clumps of sugar cane growing amid the mallow, haole koa, and yellow verbesina flowers. What will the fields become? Can they continue to stay in agriculture? Can Maui have more organic farms? They look at the fields with questions and something resembling hope. Imagine Hawaii set 500 years in the past, when people traveled between islands with outrigger canoes and took long sea voyages to distant islands like Tahiti. 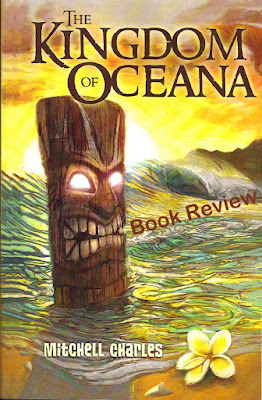 In this alternative, but ancient Hawaii, there is old magic and sorcery, wise kings and not-so-wise kings, spirit journeys in the ocean, and lots of sibling rivalry. Ailani and his brother Nahoa are royal princes who are coming of age, and they see the world through very different eyes. Their family is faced with a great threat from outside, although some see this threat as a new future for the islands. The Kingdom of Oceana, a first novel by Mitchell Charles, explores loyalty, family dynamics, romance, power struggles, tradition versus progress, and finding one’s place in the world. Things are not always what they appear to be on the surface. The writing is clean and the story moves quickly. The dialogue is entertaining and believable, especially the conflicts between Ailani and his brother. The author seems to draw on his own personal experience as a sibling, or as a parent of two teenagers. Because the story is an imaginative work of an alternative and magical ancient Hawaii, readers should not expect accuracy in details of what old Hawaii was like 500 years ago. Details like lavender essential oil, fire walking, monkeys in Tahiti, tropical fruits that may not have been grown at that time, or men and women eating together – which would likely never have happened in Hawaii 500 years ago, could stick out for readers wanting a more historically grounded perspective on ancient Hawaii. Instead, it’s best to flow with the story and accept the adventure and fantasy that Charles presents. However, the Hawaiian words and phrases used in the book are real, not fantasy. The culture of Hawaii flavors the book and readers will learn some aspects of Hawaii that are based in fact, like respect for the ocean, lava sledding, and personal gods who protect the family. Charles has a glossary to help readers with unfamiliar words.One can learn some useful Hawaiian words by studying the glossary. While geared for young adult readers, adults may find The Kingdom of Oceana enjoyable as well. Ailani is a charming protagonist who, over and over, must learn to trust himself and his inner wisdom, despite the consequences. This message is good for young people, but also a reminder for adults. The theme of potential devastation to their island kingdom also mirrors threats that our current world is facing. Some readers may find the environmental message a bit preachy or some scenes too whimsical, but I think that Charles’ love of the natural world and the ocean is a core strength of the book. Some of the ocean scenes are quite captivating. Disclaimer: I received a free copy of this book and was asked to review it in hopes of a favorable review. Since I am curious about Hawaii-inspired fiction (though I do have a lot of books on my reading list), I thought it would be fun to read. I was a little concerned since some first novels are awkwardly written or painful to read, but thankfully this was not the case. So, yes, I would recommend it for teenagers with an interest in Hawaii, the ocean, or an exotic adventure. Or for adults who like reading YA (young adult) adventure stories.